Were lifestyle, vacation and play all intermingle. 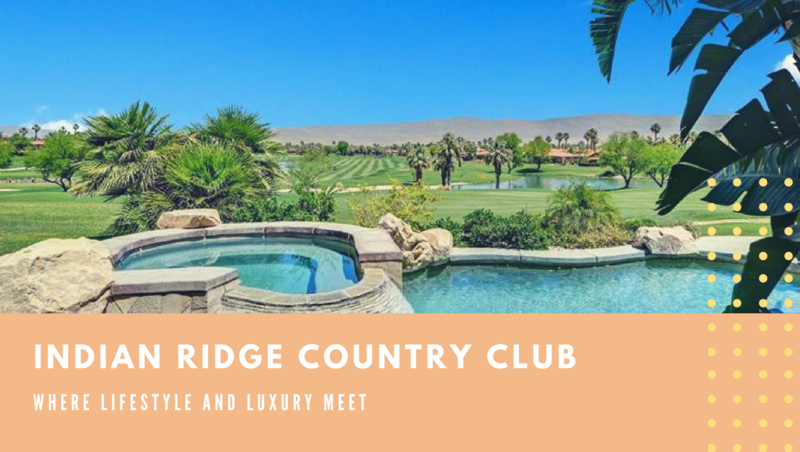 Indian Ridge Country Club is located at 76375 Country Club Dr. in Palm Desert California and features a wide range of club amenities from tennis and fitness to an active social calendar and golfing. This is where the deserts premier country club communities in a great location close to 12 10 as well as the airport and access to two of the best Arnold Palmer Signature golf courses in the area. Not only does Indian Ridge feature golf a full-service tennis facility, fitness center, full-service day spa, two fine dining restaurants and a never ending social calendar. If you're looking to live, play, and relax all in the same location, Indian Ridge is a fully developed and financially stable community. This neighborhood features over 1000 homes with a wide range of sizes and prices for every budget. This gated community offers the best in luxury lifestyle, gorgeous views, and a heavenly retreat. Homeowners dues are roughly $450 per month, which can vary based on the individual property. Most homes were built within the last 15 to 20 years and feature backyard swimming pools, hot tubs, gourmet kitchens, master on suites, fireplaces and beautiful views. Most homes offer spectacular fairway, mountain, or multiple lake views than many homes have two or three car garages. There are also condominiums and townhouses available priced from about $350,000. Dues for condominiums start at about $700 and cover all common area maintenance, landscaping, and amenity usage. If Indian Ridge sounds like your cup of tea feel free to browse all available homes for sale or condos for sale﻿ in this community. If you'd like to take a closer look for free to contact me and schedule a showing at any time.